Acronis Disk Director 11 Home is a comprehensive hard drive management tool that comes packed with essential functionality. 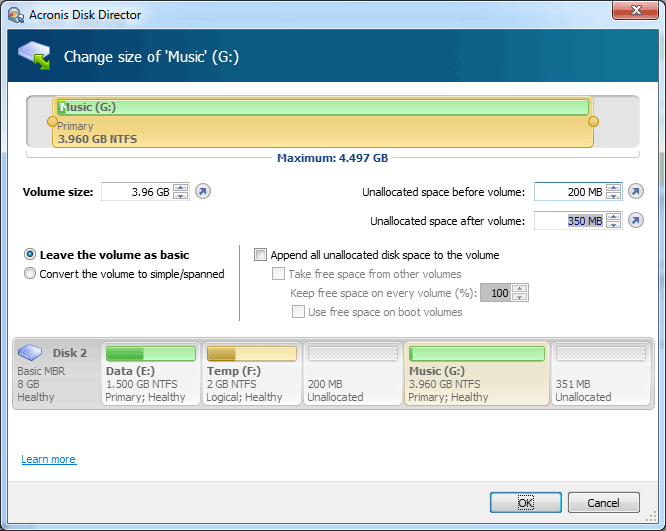 The program makes it easy to create, format, resize, copy or move your drive's partitions, for instance. You can split a partition into two, or merge two partitions into one without losing any data. The new Disk Cloning Wizard will copy your existing drive to a replacement model, avoiding the need to reinstall Windows and your applications. Or, if you're setting up a new drive from scratch, then you'll appreciate the support for Dynamic Disks, GPT disks, mirrored volumes and more, which provide a great deal of options and flexibility. The bundled boot manager, Acronis OS Selector, simplifies the process of installing multiple operating systems on one PC. You're able to install and boot an operating system from any partition on any drive, for instance; boot virus protection keeps your system safe; and you can even protect an operating system with a boot-level password. And if your PC won't start at some point, because your drive's partition data has been damaged, then Acronis Recovery Expert should be able to help. It allows you to start your system from a bootable CD, DVD, USB flash drive or USB hard drive, and then will go to work, quickly recovering lost partitions and hopefully restoring your PC to full working order. Please note, this demo version of Acronis Disk Director will only carry out volume operations whose initial and resulting size is a maximum of 100MB. The full version does not have any limitations. Important - when you purchase Acronis products from this store, you are actually purchasing through an Acronis cart, direct from Acronis, thanks to our shared use of a Cleverbridge cart. However, this also means that some currencies are not supported. Acronis convert prices from the USD price, so if you are located outside of the United States, United Kingdom or Euro-zone, you may see a slightly different price in your cart, due to this conversion.